What are the six basic questions for CNS structures? Ascending or descending? Where did the message derive? Where will the message end up? Is this a conscious modality or an unconscious one? Is this a visceral function or a somatic one? Review the embryologic development of the CNS from the three germ layers to the neural tube. The nervous system develops when the notochord induces its overlying ectoderm to become neuroectoderm and to develop into the neural plate. The neural plate folds along its central axis to form a neural groove lined on each side by a neural fold. The two neural folds fuse together and pinch off to become the neural tube. The cranial open end of the tube is the anterior (rostral) neuropore, and the caudal open end of the tube is the posterior (caudal) neuropore. The anterior neuropore closes on or before day 26 and the caudal neuropore closes before the end of the fourth week. Review week six structures of the embryo. What is the cauda equina? The collection of nerve roots at the inferior end of the vertebral canal. The arrangement reflects the fact that during fetal development, the vertebral column grows faster than the spinal cord, forcing the lower spinal nerve roots to “chase” their exit points inferiorly through the vertebral canal. Recall the patterns of grey and white in the cerebellum. Recall the patterns of grey and white in the brainstem. Recall the patterns of grey and white in the spinal cord. What is somatotopy? The entire body is represented spatially in the primary motor cortex of each hemisphere. In other words, the pyramidal cells that control foot movements are in one place and those that control hand movements are in another. Such a mapping of the body in CNS structures is called somatotopy. What is an association neuron? AKA Interneuron. Lie between motor and sensory neurons in neural pathways and shuttle signals through CNS pathways where integration occurs. Most interneurons are confined within the CNS. They make up over 99% of the neurons of the body, including most of those in the CNS. Almost all interneurons are multipolar, but there is considerable diversity in both size and fiber-branching patterns. Purkinje and pyramidal cells are examples. What is a projecting neuron? Fibers that enter the cerebral hemispheres from lower brain or cord centers, and those that leave the cortex to travel to lower areas vertically. They tie the cortex to the rest of the nervous system and to the body’s receptors and effectors. What is a commisure? Fibers that connect corresponding gray areas of the two hemispheres, enabling them to function as a coordinated whole. The largest commissure is the corpus callosum. What is CSF? found in and around the brain and spinal cord, forms a liquid cushion that gives buoyancy to the CNS structures. What is the choroid plexus? A capillary knot that protrudes into a brain ventricle; involved in forming cerebrospinal fluid. What does the choroid plexus do? The choroid plexuses form and help cleanse the CSF by removing waste products and unnecessary solutes. Through what structures does the CSF pass? Lateral 3rd and 4th ventricles; cerebral aqueduct. Dural venous sinuses: superior sagittal and straight sinuses. What are the meninges? Three connective tissue membranes that lie just external to the CNS organs. They (1) cover and protect the CNS, (2) protect blood vessels and enclose venous sinuses, (3) contain cerebrospinal fluid, and (4) form partitions in the skull. What are the layers of the meninges (outside to in)? Dura mater; arachnoid mater; pia mater. (2) a relatively thick basal lamina surrounding the external face of each capillary. What is the reason for the existence of the BBB? If the brain were exposed to such chemical variations as the rest of the body, the neurons would fire uncontrollably. Where in the CNS is the BBB not as tight? 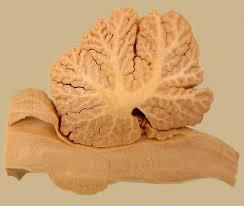 One region is the vomiting center of the brain stem, which monitors the blood for poisonous substances. Another is in the hypothalamus, which regulates water balance, body temperature, and many other metabolic activities; lack of a blood-brain barrier here is essential to allow the hypothalamus to sample the chemical composition of the blood. Describe the pyramidal tract. Major motor pathways concerned with voluntary movement; descend from pyramidal cells in the frontal lobes of each cerebral hemisphere. The direct pathway primarily regulates fast and fine (or skilled) movements. What are dermatomes? The area of skin innervated by the cutaneous branches of a single spinal nerve. Cerebral cortex It enables us to be aware of ourselves and our sensations, to communicate, remember, and understand, and to initiate voluntary movements. The cerebral cortex is composed of gray matter: neuron cell bodies, dendrites, associated glia and blood vessels, but no fiber tracts. Thalamus Sensory relay; 80% of the diencephalon; somatotopically arranged. In addition to sensory inputs, virtually all other inputs ascending to the cerebral cortex funnel through thalamic nuclei. Basal ganglia Specific gray matter areas located deep within the white matter of the cerebral hemispheres. Responsible for unconscious motor function of movement timing, power. Include caudate, putamen, and globus pallidus. Hypothalamus Responsible for overall homeostasis. Provides continuous feedback, control of chemistry, and vital organ function. Chief ganglion in ANS. Informs many indocrine functions. Cerebellum Afferent: receives notice of cortical intentions for movement and unconscious proprioceptive info. Medulla pyramidal decussation. Contain nucleus for conscious porprioception/orientation. ANS reflex center for visceral motor regulation. Review the structure and function of the eye. Review structure and function of spinal cord. Review the figure of the homunculus.